AppleBerries Early Education Service is your child's home away from home. 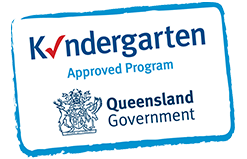 We have two centres, one located in Beenleigh and the other in Kallangur. You can trust that your little one will be cared for in a loving, safe and natural environment. Our early learning professional educators, are all passionate about the growth and development of your child and your family as a whole. We tailor our curricular activities to the individual needs of the children and their varying development stages, interests, and parent conversations to help build progressive goals for the children to ensure that they reach their developmental milestones. Our centres evoke interactive play, and we spend a lot of time exploring the unique and magnificent outdoor gardens. Our facilities have play stations that assist with children’s motor skills and creative problem-solving. The backyards are a safe space where children can stimulate their imagination, engage with other children and embrace an active and healthy learning. Our mission is to profoundly enrich the lives of our children and our families. Our personal approach helps build progressive goals for children to ensure that they reach their developmental milestones in a happy and postive environment. We've put together a list of helpful considerations for parents deciding on which childcare centre is the right choice for their family. StoryPark is an interactive app that allows you to feel close to your child when you’re far away. We can capture and share with you in real-time, updates of your child during the day.